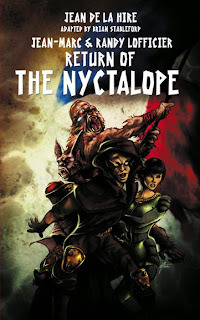 This novella by Jean-Marc and Randy Lofficier is a sequel to Jean de La Hire’s original Nyctalope novel The King of the Night; a translation and adaptation of that novel by Brian Stableford is also included in the book. In 2014, the Nyctalope returns to the planet Rhea, which he first visited in 1935. Leo currently works for Auguste Pichenet, the head of the French Intelligence Service. Leo’s lover is Gisèle d’Holbach, his liaison to French Intelligence. Rhea is revealed to have been created by a race called the Sarvants. “Auguste Pichenet” is an alias frequently used by Langelot, a young spy for SNIF (Service National d’Information Fonctionnelle) featured in novels by “Lieutenant X” (Vladimir Volkoff.) Apparently Langelot runs SNIF himself in the 21st century. Gisèle d’Holbach is related to Langelot’s fellow SNIF agent Gersende “Aspirant Mistigri” d’Holbach. The Sarvants are from Maurice Renard’s novel The Blue Peril, which has also been translated and adapted by Brian Stableford.